Everyone is welcome in the popposite jungletall or small, spotty or striped. 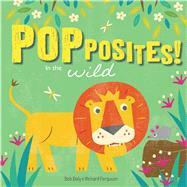 New animals pop up on every spread of this delightful book to teach young readers all about opposites. As an added bonus, each spread also features a fun fact about a jungle animal. The colorful spreads, cute illustrations, and playful text will bring smiles to the faces of young readers as they learn early concepts and about their jungle friends. Bob Daly illustrates for magazines, stationary, books, advertising, and websites, and has won awards from Print magazine, 3x3 Illustration magazine, and Minted Paper Goods. One line of party decorations were featured on People magazine's website. This is Bob’s first novelty children’s book. He lives in Washington, D.C.